The oldest bakery in my small town is famous for their angel food cupcakes. They serve them upside down and with just a bit of frosting. This is my copycat and you have to give them a try! Oh so fluffy angel food cake is always welcome on my table. But it doesn't always have to be baked in a tube pan. 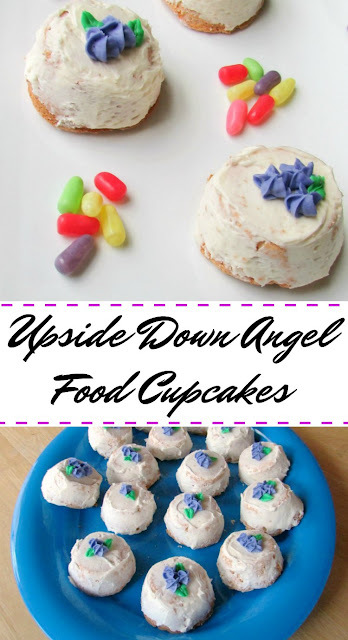 These angel food cupcakes are a home town favorite. The perfect marriage of spongy cake, a bit of frosting and lots of love go into every one. I wanted to share a bit of my home with you. But being in the middle of the country it was hard to decide what that would be. I was wracking my brain about what my region does better than others. I thought about doing BBQ pork steaks as a nod to being close to St. Louis, but I wasn't sure if I have the chops to tell other people how to grill. It was tempting to do Chicago style pizza, but I haven't made a recipe that stands up to the real deal yet. So I want to wait until I find the perfect recipe. A horseshoe sounded tempting too and I think that is one that everyone might not know about yet. But with the nice weather, I couldn't fathom the idea of doing such a heavy meal. Then a brilliant idea struck! (I know, how modest of me!) I was casting my regional net too far. Right here in my favorite hometown there is a classic favorite that everyone knows about. It is unlike anything I've seen anywhere else. We have a local bakery, called Underbrink's Bakery, that has been here since 1929. They are famous for some of their breakfast danishes, but I would argue that their claim to fame is their angel food cupcakes. They serve them upside down and with just a smear of a delicious frosting. A little frosting flower on top and they are ready to go. Anyone in town knows exactly where they came from and they are an institution. Underbrink's makes theirs in a large muffin tin, so they end up being about twice the size of mine. I went ahead and made these in a regular cupcake pan to keep it easy. I am served these at a BBQ that K.C. and I threw together. He was making ribs and pulled pork, so I figured people would be too full for a monster dessert anyway. As you can see, some of the angel food shows through the frosting. I was not being stingy. I LOOOOOVE frosting and it is not usually something I skimp on. However, with the delicate angel food, I suggest you don't go too crazy on the frosting. You want to keep it feeling light and airy and not way it down with a big ol' pile of buttercream. I have it on good authority that what sets Underbrink's frosting apart is their use of sweetened condensed milk. So, I made a sweetened condensed milk buttercream. 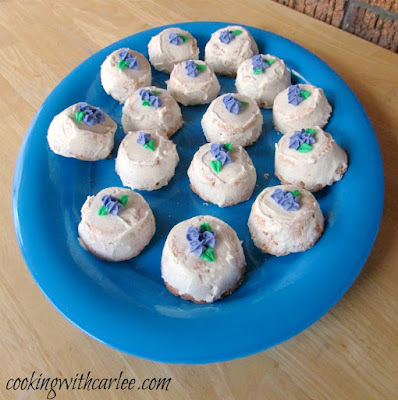 It is a great way to add a richness and silkiness to buttercream. 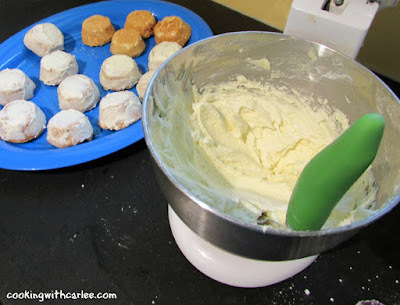 You will find yourself using it in place of classic buttercream on everything! I also used a mix of creme bouquet and vanilla in the frosting to give it that fresh from the bakery flavor. I wish I could give you a bite. They turned out so good! I find it easiest to separate eggs while they are cold. So, separate the eggs saving the yolks for another use and let the egg whites come to room temperature. Meanwhile, preheat the oven to 325 F and lightly grease 15 wells in cupcake pans. Whisk together the powdered sugar, flour and salt in a mixing bowl. Fit your mixer with the whisk attachment and beat egg whites, water, vanilla and cream of tartar on low until it starts to foam. Turn mixer to medium and slowly start to add the sugar, just a little bit at a time over the next couple of minutes. Sift in half of the dry ingredients. Fold to incorporate. Repeat with remaining dry ingredients, being careful not to overwork the batter. You don't want to deflate the egg whites, but you do want to full incorporate the ingredients. Bake for about 18 minutes. The tops should be golden and set. 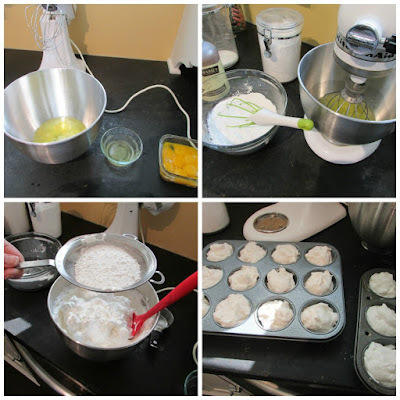 Remove from the oven and run a plastic knife around each cupcake to loosen it from the pan. Cool completely, then remove from pan. Frost the cupcakes with a skim coat of frosting. They don't have to be perfect, that is part of what makes them fun! If desired, pipe a frosting flower or two on top. These cupcakes look amazing! I've never heard of shortcake cupcakes, how cool that they are famous at your local bakery! I'm definitely going to have to try the recipe, it looks very simple too! They are really simple and soooo good! Thanks, Jessica. This weekend has been flying by, but we we have been having a great time. I hope yours has been lovely as well! Oh these look so cute! I love these minis! So cute! Thank you! I think they are fun and help in the portion control department too! Ah, this makes me wish my town had a decent bakery! All we have is the one in the grocery store. They're such cute cupcakes! We are lucky to have a couple of great ones here. One is the generations old one that makes these cupcakes and delicious pastries and the other one does the super fancy cakes! Not bad for a small town! Thank you! I can't wait to participate in more Sunday Suppers! I had no idea, where you lived, hadn't even thought about it. Now, I know. My parents and 99% of my extended family were married in the Church right by Underbrinks! Such a beautiful place! When my family used to go back "home" to visit, my parents always stopped in to get treats. I always loved the angel food cakes too. Ha! It's a small world, isn't it! It is a pretty church, we are attending a baptism there this weekend as a matter of fact! And the treats from Underbrinks are worth a trip! Wonderful to see you at the Sunday Supper table! These cakes look amazing! I must try them soon. These cupcakes are so cute and look so yummy. It is such a fun way to have them! I hope you love them! Looks delicious and what a great and versatile bite size treats to take to an event! Thanks for linking up with Funtastic Friday! These are so pretty Carlee. Thank you for sharing this delicious recipe at the #RecipeSharingParty! I hope to see you next week. Pinned and Yummed. Please visit #OverTheMoon on Sunday or #ThursdayFavoriteThings for more sharing fun! Don't forget to Comment your link #'s so I can be sure to visit and you get a chance to be featured! So cute Carlee! I love angle food cake! Me too, especially during the spring and summer! Thank you! 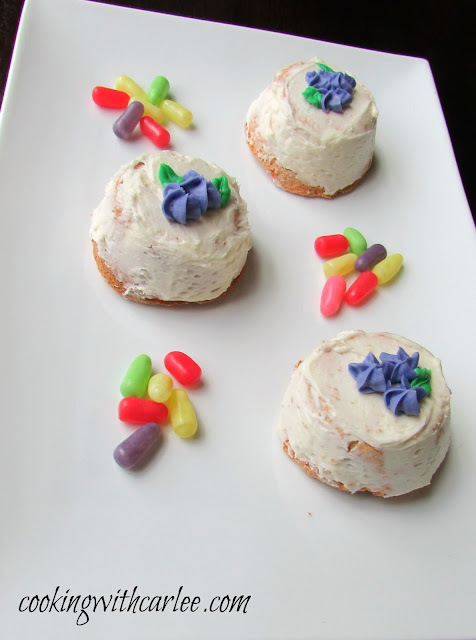 I adore angel food cake and this is such a fun way to serve it. Thank you! They are definitely a local favorite! We lived in your hometown in the 90's and I loved Underbrinks! We moved from there to St. Louis and Minnesota, but whenever I'm anywhere close, I always make a point to go to Underbrinks!!! Do you also have a recipe for their full-sized angel food cake? How fun! 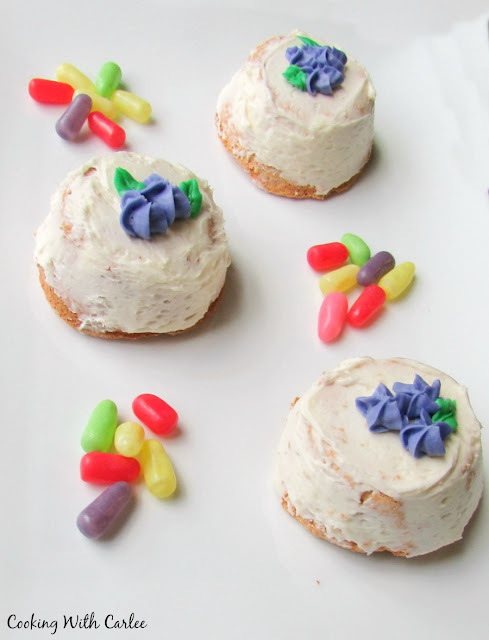 Can you believe I've never had their full-sized angel food cake,only the cupcakes? I should get one and then tinker!